“The Woman in White” Is Such A Page-Turner That I Can Read 50 Pages Per Day! It is so well-deserved wait for “The Woman in White”. I had been longing reading the book after I completed reading “The Moonstone”, my first attempt reading books by Wilkie Collins which turned out to be unforgettable experience for me. 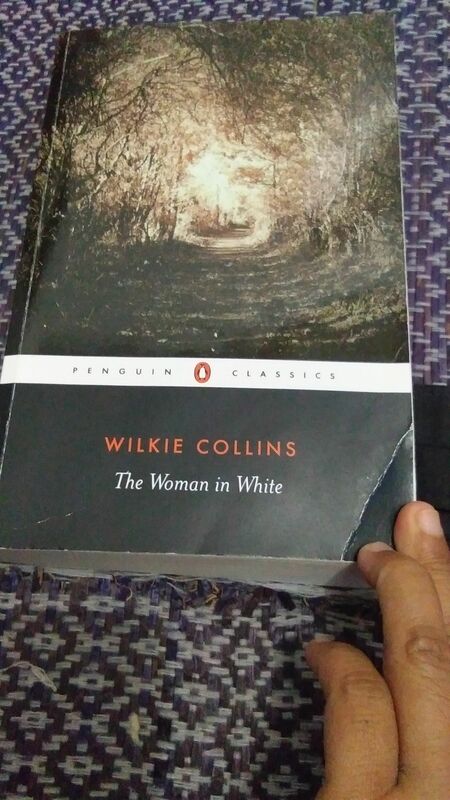 As a longtime fan of romantic, feminism, realistic, social stories by Thomas Hardy, George Eliot, Bronte sisters and lately Charles Dickens, Wilkie Collins is such a refreshment. “The Moonstone” has opened my eyes on enduring charm of detective, mysterious story can offer. So when I found out that “The Woman in White” is better than “The Moonstone”, I, of course, put it on top of my would-be read list. After some moments, I discovered the book at my favorite bookstore in Jakarta but I didn’t buy it because it was pricey. I left the store, thought about the book then felt disappointed that the book was gone into someone else’s hands. Last month, I was joyful that the store restocked the title in different version. I almost bought it before my friend, Wida, reminded me that our good pal, Dian, promised to bring the book when she arrived in Jakarta some weeks after our errand at the store. Again, I had to wait for the novel. Three days ago, Dian fulfilled her vow. I was so happy that I eventually got the novel I had been looking forward for months. Call me too much, my friends, but when it comes to fictions, I can be that, yeah, you know, that much. “The Woman in White” is surprisingly very thick. I thought it would be like 300 pages, like “The Moonstone”. Yet, it doubles that number. I was a little bit shocked to have found the number but after I looked at the book’s font, I wholly believed that I would finish the book, sooner or later. I never thought I read the novel way quicker that I had planned. As I’m writing this post, I am at 174 out of 627 pages. It has been a crazy process. I didn’t intend this all, blame the book, LOL! I would like to thank Mr. Collins, first of all, for pulling me out from another comfortable reading zone. While “The Moonstone” successfully wows me on detective stories, “The Woman in White” challenges me as a self-denounced coward. Really, I am afraid of watching or reading horror books. As my reading progress of the novel sees, I try hard not to visualize the woman in white alias Anne Catherick. She’s not a ghost, by the way, but she suffers from mental illness since very early age. She is put into a private asylum but later on, she is able to escape. The novel turns out as non-ghostly kind of story but Mr. Collins creates scary atmosphere here and there. I have to prepare myself when Anne comes up in the novel because she is strange, hysterical when she hears something related to the asylum or Sir Percival Glyde. Thankfully, Mr. Collins doesn’t mention her all the time. And this what makes the novel very engrossing for me. I know why “The Woman in White” is in better quality than “The Moonstone”. On the surface, Mr. Collins exquisitely describe people in the book, landscape, settings and many more. To sum it up in this point, the novel is so Victorian in a way that it is beautifully crafted. The plot moves so, so smooth. I don’t see, at least for the time being, that there lies a gap between one scene to the other. All lead up to some grand themes which surprises me because I thought the one and only primary subject of the book would be the woman in white. In fact, I found serious and diverse themes wrapped in this very packed book (though for 174 pages so far). I got views on cultural issues between UK natives and Italians, as seen in Mr. Pesca, good friend of Mr. Walter Hartright and Mr. Phillip Fairlie’s hatred to Count Fosco. Romance between Mr. Walter Hartright to Miss Laura Fairlie isn’t something new as the former is a layman while the latter inherits huge amount of money and property. Mr. Collins’s rigid explanations on the forbidden love story is what makes the novel somehow remains essential and captivating to look forward. That is what I have got so far from the pages I finished reading. It’s thrilling, saddening, emotional. There will be many to be written I think in the next posts. For now, I will go to sleep, hehee..